The nuts in this mixture have the intense nutty flavor you expect from roasted nuts. Their individuality is not compromised, yet the compatibility of diverse flavors is highly evident as you enjoy eating handfuls of these nuts. Our roasted salted mixed nuts provide a flavorful experience that you'll want to enjoy time and time again. 50% Peanuts, Almonds, Cashews, Hazelnuts, Pecans, Sunflower Oil and Salt. Cashews Product of India, Vietnam or Brazil. Hazelnuts are Products of Turkey or USA. I was used to eating mixed nuts that didn’t include peanuts, but they’re totally up front about the peanut percentage and I discovered that I actually like the proportions. 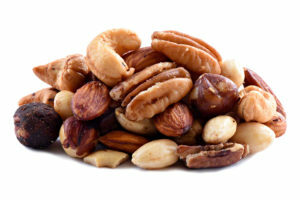 I never eat pecans or cashews by themselves, but I love them in this mix. Mixed nuts is always good. One feels healthy when eating them. Crunchy, perfectly salted and non greasy. A great value for the price! If you like nuts you will like these mixed nuts. Perfect for family visiting for the holidays. These nuts are a real treat. I recommend these nuts for quality and freshness. Great quality, we will order again! another good product at a good price…. watch for a sale!!! They are great !!! I will order my mixed nuts here !